When it comes to global health and development, it seems that Bill Gates leaves virtually no stone unturned. 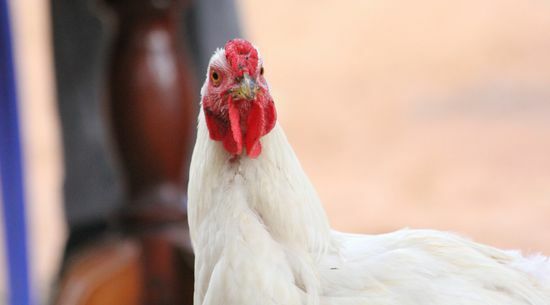 Now, the billionaire philanthropist has turned his attention to chickens and how they can alleviate poverty. Coop Dreams is a short trivia game all about poultry. When players answer the questions correctly, the Gates Foundation—which has partnered with Heifer International in this latest venture—will donate a flock of chickens to a family living in sub-Saharan Africa. The game, which went live on Bill Gates' personal blog, gatesnotes, asked players what they would do if they were living on less than $2 per day. Bill Gates answered the question himself, saying, “I would raise chickens.” More on that later. The goal of Coop Dreams is to donate 100,000 chickens or about 10,000 flocks of chicks and to increase the total percentage of rural families raising vaccinated chickens from around five percent to 30 percent. Heifer International already runs an animal gifting program to which people can donate to provide families a gift of animals such as chickens, geese, goats, alpaca, pigs, sheep, rabbits, and even water buffalo. Donors can give a flock of chicks for $20. If my math holds, that means the Gates Foundation is putting up $200,000 for the 10,000 flocks its hopes to give to families in sub-Saharan Africa. That doesn’t seem like a lot of money compared to some of the mind-boggling grants the Gates Foundation regularly makes. But the impact of those flocks of chickens is perhaps more important and definitely bigger than that $200,000 price tag. Which brings me back to why Bill Gates would raise chickens if he wasn’t one of the wealthiest men in the world and was instead living on less than $2 a day. On the Coop Dreams front, eating more chicken and the eggs they produce can bend the malnutrition mortality curve in a positive direction. Also, farmers can choose to allow the eggs to incubate and hatch, and sell the chicks to buy nutritious food. Now let’s talk about how chickens empower women and help alleviate poverty. Chickens tend to stay close to home and are typically maintained by women. In fact, women are generally the main owners of poultry in developing countries. Women, then, not only have control over the selling of the chickens and the eggs, but how that income is spent. Numerous studies show that in developing countries, when women have control over their household’s income, children are the main beneficiaries as result of increased spending on education and food. Of course, that earned income also speaks to poverty alleviation. Gates digs into this a bit further. Suppose that a woman has a small flock of five hens. In a few months, that flock can grow to some 40 chicks. If she sells those chicks at the typical West African price of $5 per bird, then she can earn over $1,000 per year, which is $300 above the extreme poverty line. Then there’s the Bolivia blowback. In Bolivia’s defense, it is a resource-rich country. It also produces nearly 200 million chickens each year and the country’s economy is largely considered one of the strongest in South America. In Gates’ defense, Bolivia does have its challenges. Despite overall favorable economic growth over the past decade or so, nearly 40 percent of its people live in poverty. So while Gates’ Coop Dreams seem pretty well grounded, it’s clear that this strategy isn’t going to work for everybody. But hey, as the saying goes, you can’t make an omelet without breaking a few eggs.